Many have tried to stop smoking but most of them failed to do so, aren't they? It's because the brain of a smoker is programmed to request another nicotine substance just like the symptom of prohibited drug users. Drinking cool water; deep breathing; drinking vinegar kelp; chewing mint candy; drinking hot beverage; physical exercise; brushing teeth and others. After they did these, they still failed, didn't they? The reason why stopping smoking is so difficult is in the mechanism of the brain system itself. In the brain, the information transmission substance called acetylcholine is present. When the tobacco is inhaled, the nicotine works in place of the acetylcholine, activating brain to wake up. Whenever you stop smoking (nonpresence of nicotine), the acetylcholine will inform to seek for smoking. However, this time, for sure, you can succeed to stop smoking. Here's how. Do you remember when a flower is dying, and placing it in the cold water will make it stand straight again. We understood that acetylcholine in the brain has similar phenomenon. We tried to wash face with cold water, and place an ice bag on the head and to the face. 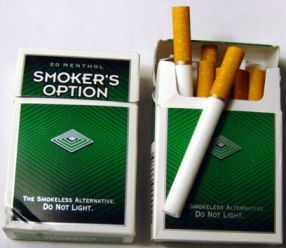 All of these have something to do to minimize smoking but not perfect. Finally, we tried to chew ice cube in the mouth. And it was very effective. We can stop smoking, yet brain was clear, as clear as when we are smoking. That's it, so we came to conclusion. Whenever you want to smoke, just chew a piece of ice cube, then you can perfectly stop smoking. After a week time, you will be a nonsmoker successfully. Tip: Carry a small thermojar with ice cubes in it wherever you go. In the car, train, bus, or in the office, wherever you go, ice cubes in a thermojar will do the trick. That's all. Your brain is always fresh, as fresh as when you did smoking.